Students at The Radclyffe School will be developing a head for heights from this week, as a six metre climbing wall takes shape. 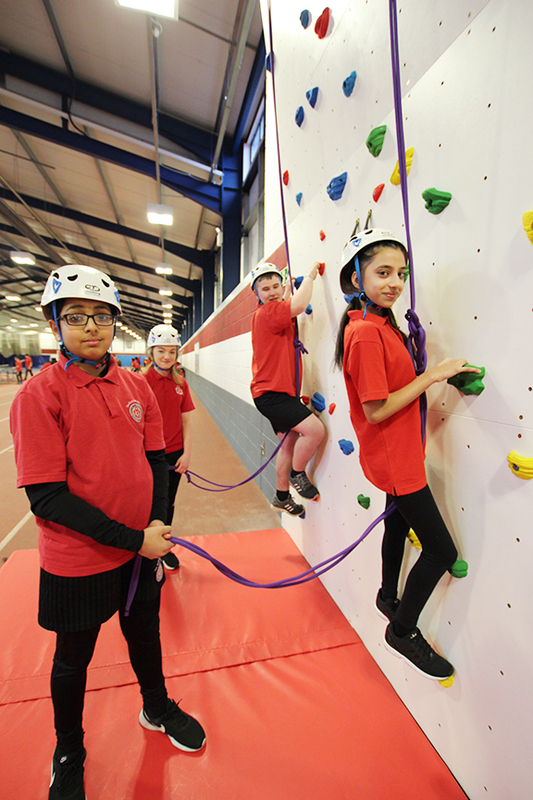 The latest addition to the outstanding sports and PE facilities at the school will enable students to learn climbing, traversing and bouldering. The school arranged for a length of wall otherwise unused to undergo the transformation to a high quality facility. Climbing Wall Solutions have designed and built the wall within the Sports Village at The Radclyffe School. The school recently received the School Games Platinum Mark for the quality and breadth of opportunities in sport, and students are looking forward to using the new facility. Across 30 sq. m of wall, individual climbing holds attach to the wall, which can be moved to create new climbing routes, so the wall is suitable for all ages, abilities and level of experience. Safety is of course a priority in the design, and high quality crash mats sit at the foot of the wall to minimise any risk of injury.